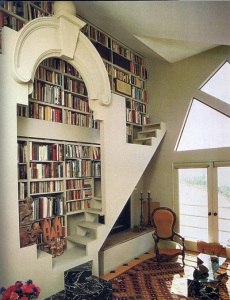 Several weeks ago, I published an image of a bookcase with a built-in staircase, which proved to be tremendously popular. 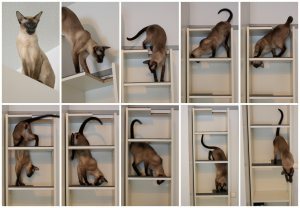 Now, you can get an easy to assemble bookshelf which will not only house your treasured volumes, but keep you cats entertained as well. The Cat-Library from Corentin Dombrecht is billed as a 100% Cat-Friendly Modular Bookshelf made of FSC-certified Birch Plywood. The clever modular bookshelf design includes an irresistible cat basket, which draws the cat up the stair-like shelves to the top of the bookshelf. You can add to and configure the box-like components as you desire. If you want to try a DIY option, then check out this Ikea Billy hack and create a slim cat tower. This entry was posted in Uncategorized on August 7, 2015 by Laine Cunningham.